In South Asia, livelihoods are intricately intertwined with agricultural production, and thus highly dependent on weather. For millennia, the yearly monsoon rains have been the lifeblood of agriculture, but climate change is making this annual boon increasingly unpredictable both in timing and intensity, exposing farmers’ livelihoods to increased production risks. There is considerable interest within the international development community in mitigating these risks through insurance. While insurance has been around for a very long time, many of its more traditional forms have suffered from low demand and asymmetric information between insured and insurer, giving rise to adverse selection and moral hazard. The agricultural research community has responded to these challenges by identifying and developing research-based innovations for agricultural insurance, such as index-based insurance programs that can minimize the severity of adverse selection and moral hazard; the use of cutting edge remote sensing and information technologies; and the bundling of insurance with novel “climate-smart” agricultural (CSA) technologies and practices that are more resilient to adverse weather conditions than traditional technologies and practices, thus serving an important risk management function in their own right. 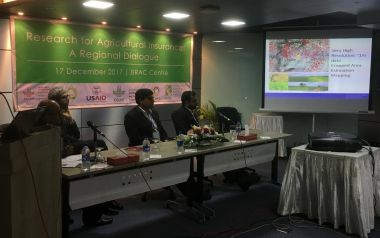 Policy makers, practitioners, and researchers from Bangladesh, India, and Nepal convened to share their experiences with implementing agricultural insurance across the region, and to learn about the latest agricultural research on this subject. The chief guest, Wais Kabir, executive director of the Krishi Gobeshona Foundation, and keynote speaker, Saleemul Huq, director of the International Center for Climate Change and Development (ICCCAD), helped to lay the foundation for the day’s discussion. Huq’s keynote address highlighted the role of agricultural insurance as an instrument for meeting the key targets in the Paris climate agreement—not only by offering compensation for crop losses and other economic damage, but also by providing a mechanism to improve adaptation, with subsequent benefits from reduced agricultural sector emissions. The workshop presented evidence and case studies that vividly illustrated how research can help improve insurance products and programs to help meet compensation, adaptation, and emissions targets. One of the main challenges in implementing the largest agricultural insurance program in South Asia—India’s Pradhan Mantri Fasal Bima Yojana (PMFBY)—is loss assessment. To verify losses, PMFBY aims to measure average yields at the village level through intensive crop-cutting exercises. This is a daunting task, requiring crop samples to be collected from three million fields within the short period before harvest. How could research community help? 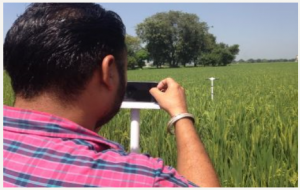 Agricultural research has already helped advance the use of satellite imagery and other remote sensing techniques for crop loss assessment, and case studies are showing that it is possible to use such methods to detect prevented or delayed sowing, which could ultimately reduce the number of crop samples required for village-level yield assessments. While promising, remote sensing is hardly a panacea. First, the resolution of open-access or affordable satellite imagery is still too coarse to detect plot-level losses. Second, the notion of satellites orbiting the earth and collecting images from space is an abstract concept to many farmers, and much evidence has shown that insurance products must be presented with simplicity and transparency to generate sufficient interest among potential buyers. Third, data processing and evaluation of remotely sensed images is often a major challenge. Unmanned aerial vehicles (UAVs) offer higher resolution imagery than satellites, but are expensive to operate and may face various regulatory hurdles in different contexts. There are other solutions that can complement remote sensing techniques and address some of these challenges. The IFPRI-led picture-based crop insurance (PBI) project, for example, demonstrates that it is possible to engage farmers directly in taking a stream of smartphone pictures to document crop losses. The agricultural research community can also play an important role by positioning insurance as one instrument in a larger portfolio of risk management tools. Smallholder farmers can also shield their livelihoods from risk through savings, credit, and informal insurance networks, and by adopting CSA technologies. Examples of the latter include conservation agriculture (a suite of sustainable agricultural and land management practices) and stress-tolerant cultivars such as drought-tolerant maize or flood-tolerant rice. CGIAR researchers, working with counterparts from national agricultural research systems, have developed many improved seed varieties for various staple crops that can reduce farmers’ exposure to weather-related production risk and increase yield stability. But these stress-tolerant varieties can protect crops only up to a point, leaving production exposed in the event of severe droughts or floods. When sold in tandem with a complementary insurance product, however, the bundle provides a near comprehensive risk management solution, as demonstrated by IFPRI-led research in Odisha, India. Under this approach, weather index insurance can be designed to pay out only under more extreme weather conditions causing catastrophic losses, while CSA technologies shield livelihoods from more moderate weather shocks and accompanying income losses. This can also help lower premiums, improving the demand for insurance. A final, important issue that arose during the dialogue is that the countries of South Asia vary in many aspects: In topography and the risks farmers face, and in the policy and regulatory environments where insurance markets operate. In India, for instance, the government is very active in promoting agricultural insurance under PMFBY through large subsidies, while in Bangladesh and Nepal, insurance is not a prominent feature of agricultural development strategies or policies. Such differences raise important questions about how to best organize insurance markets and innovation activities country by country. This is a slightly modified version of the original IFPRI blog Research for agricultural insurance in South Asia: A regional dialogue. Berber Kramer is a Research Fellow in IFPRI's Markets, Trade, and Institutions Division; Patrick Ward is a Research Fellow in IFPRI's Environment and Production Technology Division.